Pisceans are generally of short stature, of plump body, short limbs, full of fleshy face, pale complexion, tendency to double chin, muscular and spherical shoulders. Big and protruding eyes, soft and silky hair. Wide mouth and inclining to corpulence especially in latter years. Quick in understanding, inspirational, versatile, easy going,good natured, changeful, psychic, emotional, fond of music, passionate,affectionate and charitable. Sometimes they are secretive, reserved or mysterious in their way of doing things. Philosophical and lead a romantic life. Kind, loving, truthful and of sympathetic nature. Courteous and hospitable. Restless, helpful and humane. Lacking generally in self confidence, self esteem, modest, timid, and they can not harm any one. 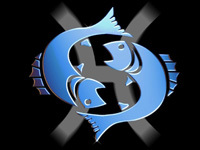 Being dual sign Pisceans are puzzle to others and to himself even, can not be steady,mostly sweet tempered and social. Led away by fancies and new ideas, polite and modest. At times they are over anxious and become disheartened,indecisive and lacking in life and energy. They use best of circumstances, vital temperament. Of varying moods, over liberal, keep hopes on other's promises, rely friends and many a times suffer at their hands. Addicted to drink,love psychic and occult science.They are best suited as poets, musicians, in planning commission, painters,nurses, caterers, teachers, accountants, banker, actors or as Liaison officers etc.Pisceans should marry for happy married life to persons born with Virgo and Cancer ascendants. Being a watery sign one will be addicted to drink. the persons will suffer from gastric troubles, varicose veins or guinea worms. Affliction of bile and feet is denoted. This sign governs ankle, feet, teeth and left eye and the diseases indicated are consumption, tuberculosis, tumors and mucous troubles.Planets in Poorva Bhadra constellation shows abdominal tumour, enlarged liver and enzymes deficiency and in Rewati star causes deafness, general nervous debility, cramps, etc.Sun in Pisces produces perspiration of feet, chillness, intestinal troubles due to lack of blood supply and typhoid. Moon denote drink, over drugging the system. Mars indicates fracture in the foot, deformities, a piles, inflammation in the bowels and hernia. Mercury causes nervous debility, deafness and tuberculosis. Jupiter in Pisces denotes swollen feet, perspiration, enlargements of liver, abdominal tumor, deficiency of enzymes and intestine troubles.Venus causes gout, intestinal troubles whereas Saturn causes Rheumatism,foot-droop, tuberculosis and dropsy. Pisceans will remain attracted to the romantic life,prefer beauty of the partner and intellect. Suspicious by nature towards partner which kills their love but they like flattery. They should not select any partner who is free with all. Since Pisces is dual sign, the person will be affectionte but reluctant at times whereas in other moments they will be amorous and affectionate. Will lead a happy married life.Such persons are kind, sympathetic, and loyal. Good and moody persons.Bold, brave and independent. They love their children who are also affectionate and successful in life. Pisceans husbands are affectionate, kind and full of love but suspicious by nature. For a happy and prosperous married life they should not doubt the partner. Throughout their life they will be attracted towards romantic side. Very helpful and maintain harmony at home. Sincere and true. Piscean born ladies are beautiful, of big and protruding eyes. They will have tendency to flatulence as age advances. Romantic and passionate,Ladies are over liberal and have nature of unbounded generosity which should be avoided by them lest they fall victim of bad social elements and ruin their life. She can not be steady in her love. They are sweet tempered, very social, polite and modest and can easily be led away by fancies and fresh ideas. They keep the home modern and in a top condition. They love domestic life on the whole. Pisceans should not rely upon all their friends, must be choosy about them as they all will not be sincere. The friends, a few of them,will outwardly be honest but inwardly scoundral, cheat and selfish. Avoid suspicious nature and varying moods. Cultivate push, be generous but not overliberal, do not be contemplating and dreaming always and they should not entertain and rely on other's promises. Pisceans have food business ability. They are endowed with wealth and power. They do not relish the idea of being dependent on their children. In old age so they keep the money safe for that period. They are helpful to needy person and make advances of money to those who can repay on demand. They have plurity of interests. Pisceans have many friends and are happy to entertain them at home, wish to have educated partner in life and have good children. They love happy domestic life and are very affectionate.Throughout their married life they do not get tired to carry out the romantic legend of lovers. Tempted to fancies of life and with every pretty face and their fancies will be wanderings. Pisceans can be successful as accountants, bankers, music and opera houses, cinema, occult sciences, actors and a good business ability and can be a successful liaison officer, Managing Director or Chairman. Best suited for Navy Shipping Corporation etc. deals in drinks, oils, beverages,cosmetics, chemicals, medical and education departments.Pisceans can not concentrate and do hard work. But if they are compelled to do then as they are methodical, persevering, industrious, true, sincere and honest.The professions connected with Saturn will result in loss and be avoided. Sundays, Tuesdays and Thursdays are favourable and lucky days. Mondays and Saturdays will cause loss and unfavourable also the wednesdays and Fridays will not be harmonious fruitful.Lucky Colours. Red, Yellow, Rose and Orange are favourable. Avoid Blue. For partners prosperity, the partner should use White, Cream and Green.Lucky Numbers. Favourable and lucky numbers are 1,4,3 and 9. Avoid 8,other numbers are passive.Lucky Stones. Topaz or Pukhraj in Gold be used in first finger of right hand on Thursday morning after prayers.When Jupiter is malefic or unfavourable use of white pearl in silver or yellow sapphire plus red coral is recommended for use to minimise and avoidthe evils and difficulties. Which hand can wear yellow sapphire for meena ascendent married lady ?